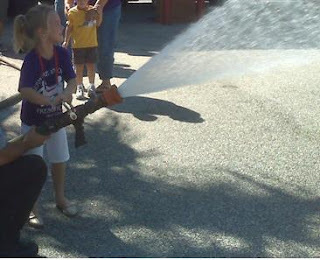 Me playing fireman or firewoman or whatever...that hose is powerful! My green day so far has been just perfect. I spent the morning with my daughter and her preschool class getting a tour of our local fire station from some pretty hunky firefighters. Not only were they hunky, they were green and I am not even sure they knew it. I was sitting in a chair listening to the big chief in charge talking with some other moms and he was saying that 30 years ago, the intensity of a house fire was half of what it is today. This makes house fires even more dangerous than they were just decades ago. The culprit? The widespread use of petroleum based products in our homes has replaced other, less flammable products. I had never before thought about how our dependence on oil has made us more susceptible to losing our homes through fire. I hopped up and ran over to chat with him and I could tell that this was something that this seasoned fireman was obviously not too happy about. Hayden-Jay had a blast and then they sprayed all of the kids with the hose. Not so sure the teachers liked that very much! "Things are just not as natural as they used to be and that makes fires much more intense. Of course a cotton shirt will burn," he said, "but it won't go up in flames as fast as a synthetic. And that's all just crude." he said. I shared with him that I am doing all I can through Environmental Booty to help people to decide to reduce their oil consumption through exerting their purchasing power. He kind of looked at me and shook his head, "It's everywhere, in almost everything." I told him that I knew that, but our future will be a much safer one when we all finally buy green, safe products that are provided by amazing suppliers who are passionate about not only their bottom line, but our health and the health of our planet. You guys know that I really do have faith in companies to go green in every way from their supply chain to the products that they offer to the coffee that they serve in their break rooms. I know that together, consumers and suppliers can have a conversation that will (without government intervention) provide safe consumables. I know this becasue the other great green part to my day has been finding crystal light made with sugar and Truvia but no aspartame!!!!!!! WAY TO GO KRAFT!!!!!!! 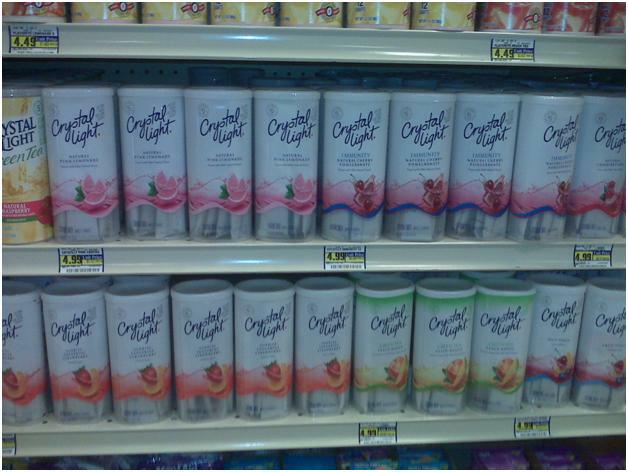 You might remember that it was Kraft Food's Crystal Light that served as my impetus to start Environmental Booty. I wouldn't touch the stuff for the past two years and now, well, . 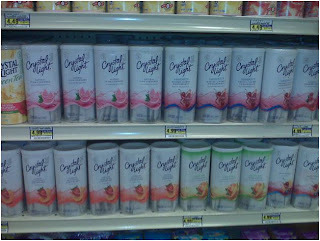 I am an addict again; but this time it's okay because there is nor aspartame in Crystal Light's Pure Fitness drink mix. 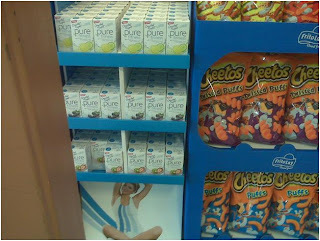 Today when I was at the market, hiding behind a big pillar and sitting right beside some Cheetos (hmmm), I saw a display for Crystal Light Pure Fitness. The Pure Fitness contains NO artificial sweeteners, flavors or preservatives and is 15 calories per serving; although (sadly) other Crystal Light drinks contain aspartame and are 0 calories per serving. A serving is half of a packet but I have been adding 1/3 of a packet to my green tea and it is so yummy. I am partial to the Strawberry Kiwi but my girls like the Lemon Lime. It certainly is nice to have yet another healthy option for my family to drink. I am not a huge fan of the way that the folks at Cargill patented the Rebiana from the stevia plant, while others have been left to only use and market stevia if it is labeled as a supplement. I must say that it was a shrewd business move that now has the potential to help millions of people reduce their sugar intake. Hey, what can I say, I don't hold grudges and I worked in The Land at Epcot here in Orlando which was a Kraft Food's sponsored attraction. I loved working there and have fond memories of that time in my life. Hey Kraft Foods, would it be too much to ask to get rid of aspartame in all of your Crystal Light..um...and the rest of your reduced calorie lines? I'm saying, "Please!"